In mid-March it became apparent that I would need to travel to South Korea on business. The prospect of a fourth long haul work trip in five months wasn't exactly appealing, but it did at least give me the chance to pick up a handful of new roller coasters. A few minutes with Coaster Count gave me the approximate locations of the credits I needed in country, and I used that data to plot out six possible day trips with different intensity levels that I could choose between on the fly. The most relaxed itinerary gave me a late start and a short journey on the Seoul Metro to Children's Grand Park, which I planned to follow up with dinner at the nearby Hard Rock Café. This required half a day at the outside, however, and given that I decided to spend some time researching the various known parks in the Seoul area to see whether there might be anything else available. The existing entries in RCDB all came up dry, and it was only when I began searching through TripAdvisor that I happened upon Wolmi Theme Park, which had apparently added a coaster in 2017. Further digging revealed it to be a spinning figure eight, and while this wasn't what I'd hoped to find it nevertheless gave me a way to productively utilise a few jet lagged hours. 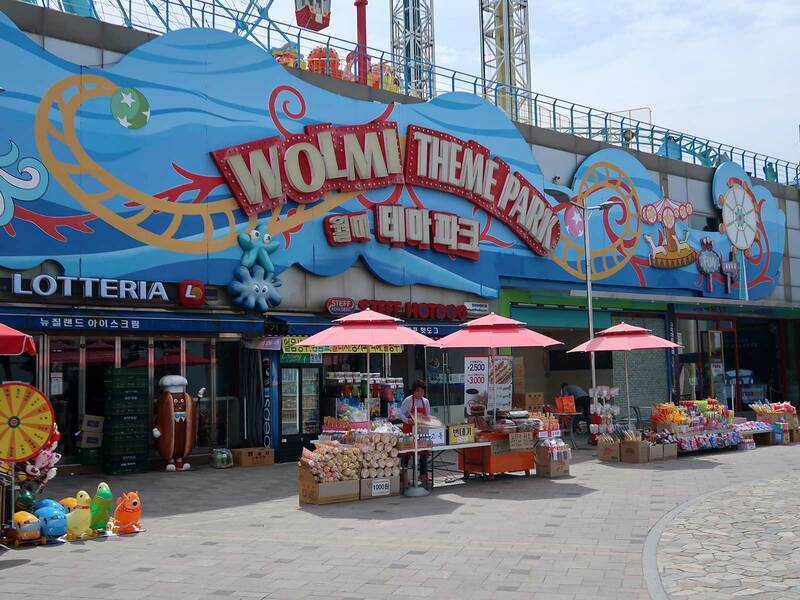 Wolmido is an island to the west of Seoul that features a large public park and a seaside boardwalk that feels like a Korean version of Ocean City MD. An elevated monorail circles the island and connects it to nearby Incheon Station, though the $60 million dollar system has never operated due to serious safety defects in its construction. The boardwalk features a large number of shops selling the sort of tat indigenous to such places, as well as a variety of restaurants specialising in Chicken and Beer, the local haute cuisine. The northern end features a standalone reverse bungee ride and two small amusement parks, both of which are anchored by a full size Pirate Ship and a Tagada. The walk from these to Wolmi Theme Park takes around ten minutes. The park operates on a pay-per-ride system, with a centralised ticket booth that has no windows and only a small slit for exchanging money for ride coupons. This system is perfectly adquate for those who speak Korean, but more than a little challenging for those who don't given that all the rides are priced differently. The old reliable method of taking a photograph of my targets was impossible due to lack of space, and gesticulation was similarly out of the question. After ninety embarrassing seconds I was rescued by a local octogenarian with passable English, who helped me procure one coupon for the Ferris wheel and another for Spin Coaster (#2420). 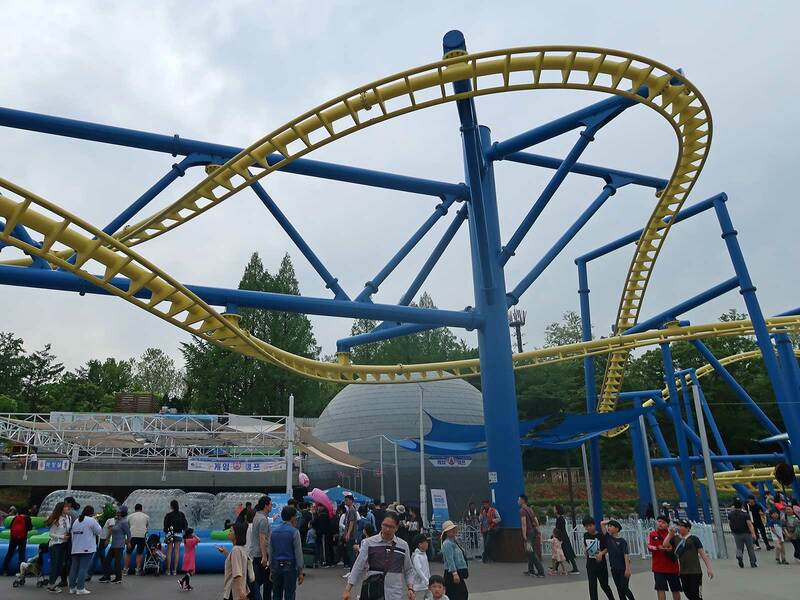 Over the last few years I think I've said pretty much all there is to say about the compact spinning design from SBF Rides, which I fully expect to displace the ubiquitous Wacky Worm as the world's most common family coaster at some point in the next decade. The only really interesting thing about this version is its location, which is on the roof of a three storey building. The light blue track isn't visible from ground level, perhaps explaining why management have elected to mount the ride's banner sign on a nearby wall instead of attaching it to the track. This has been made more noticeable with the addition of a large billboard featuring what has to be a composite photograph, as two adult passengers look to be having the time of their lives while the other six in the background of the shot look profoundly bored. The Moon Eye Wheel is well worth doing for those interested in photography, as it comes within a few metres of a pair of S&S towers. I didn't manage to capture these in motion, but I did manage a rather unique angle looking down at the ground that would ordinarily only be visible with a drone. Tinted glass on the front and back of the cars was a mild nuisance, but fortunately there were small sliding shutters that were more than adequate for my needs. Children's Grand Park is an enormous public park in central Seoul with a wide variety of activities geared at families. It took me roughly two hours to get there from my previous stop, comprising a thirty minute walk to the Metro followed by a further ninety to the park's eponymous station. It was quickly evident that the park was very crowded indeed, leading me to a realisation that should have been obvious in hindsight; visiting a park geared at children on the Children's Day national holiday is not particularly smart. The ticket booth had clear photographs of the various rides available, including the two coasters that I was expecting, and rather than dawdle I bought a pair of coupons and joined the enormous queue for Family Coaster (#2421), an inverted ride from Vekoma that is the largest in the park by some margin. It was quickly evident that I was in for a long wait, as the single train was being dispatched at five minute intervals. Worse yet, there was a huge and virtually continuous issue with queue jumping; every sixty seconds or so a parent and/or child would ease their way in or out of the middle of the cattle grid. None of the locals appeared bothered by this shameless breach of etiquette, and as a solo adult I decided that the best thing to do was to put my headphones in and pretend to be somewhere else. I was almost at the half way point in the queue roughly forty-five minutes in when operations paused briefly for a shift change. The effect of this was dramatic, as the new crew decided that it might be worth loading the station air gates while the train was on course rather than waiting for the station to be emptied. This simple procedural change virtually tripled throughput at a stroke, and as a result I was on board in the back left seat after a total wait time of one hour. The ride layout was the same as Freedom Flyer and Kvasten, and as with those installations it was a good ride with superb visuals thanks to a good portion of the layout routing above the midway. I went for a walk around the park after disembarking, but despite my best efforts I couldn't find the Crazy Mouse anywhere. In the end I managed to lay my hands on a park map, which indicated that it was supposed to be on a concrete plinth that today held a number of picnic tables and midway games operating from shipping containers. The edge of the space was protected by temporary safety barriers and a number of rubber mats, suggesting a very recent removal. It wasn't a huge loss (my only other encounter with the same design was not positive) but it would have been interesting to see if this version was any better than its English cousin. (The park has preserved cars from two of its former coasters in a small exhibit near the entrance; one wonders if a mouse car will appear here in due course?). I ended up using my remaining ticket in the Ghost House, a walkthrough attraction that was as brief as it was pointless; the interior was almost completely black with only a handful of rudimentary scenes that would not have been out of place in a fairground installation.